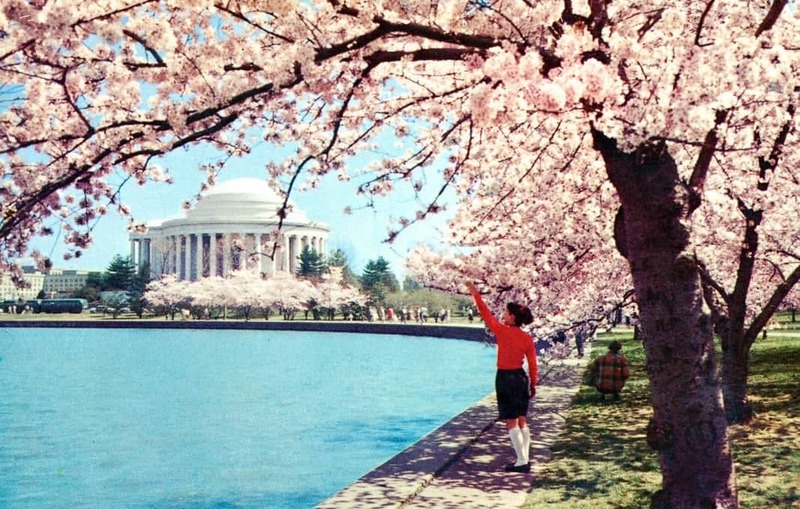 Here's a fun view of the cherry blossoms and the Jefferson Memorial from an old postcard. It's postmarked May 1968, but I don't know when the photo was actually taken or who took it. The shot was taken from the bank of the Tidal Basin to the southwest of the Jefferson Memorial. It still looks pretty similar today, although not quite the same. These days, water often laps over the top of the wall of the Tidal Basin in this section. And these days you definitely wouldn't find tourist buses pulled up next to the Jefferson Memorial like the ones at the far left of the photo. It's certainly a contrast to some of the other developments in Washington DC in 1968. It was a rough year for the city. It was the height of antiwar protests over Vietnam. There were riots in the streets less than 2 miles from where this photo was taken, in the wake of the assassination of Dr. Martin Luther King Jr. Robert F. Kennedy was assassinated. And LBJ announced he wasn't running in that year's election.